A certain shape of the days ahead is growing in my mind. That shape, at least today, might include Guatemala. Might. Guatemala is probably ill advised, but it is calling to me. I am not too far from the boarder. 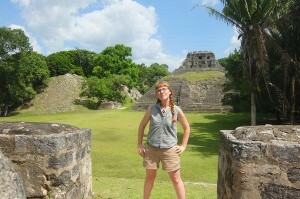 I saw Guatemala today as the Maya saw Guatemala: from atop a massive temple. I left Belmopan this morning for San Ignacio (Cayo to its friends). I did some quality bus crowding with my massive pack and got off in the Cayo town square. It seems a bit familiar here. Touristy though…which I guess is familiar too. The ice cream place is the same. I remember this shop and that. I walked up the hill. Two absolutely adorable kids asked me if I wanted a room. I had planned to stay where they were sitting anyway, but it was fun to let them think they had sealed the deal. They were about 7 years old, a boy and girl cousins (“But like brother and sister”) and were bored enough to be throwing ice on the street to watch it melt…and proud enough of the melting ice to show me it. I said they could start measuring the temperature by how long it took the ice to melt. The little boy speculated that it was a 5 minute ice melt day. They followed me to my room and, somewhere along the way, decided I was Canadian. I let that one just ride. They asked me if there were wolves in Canada and I said yes. Then they told me how wolves were coming down from Canada and following deer and that you should never run away from a wolf because they will chase you. “We saw that on animal planet”. Also if there is a grizzly bear you should make yourself look very big but if it is a black bear you should make lots of noise. “We read that in a book”. 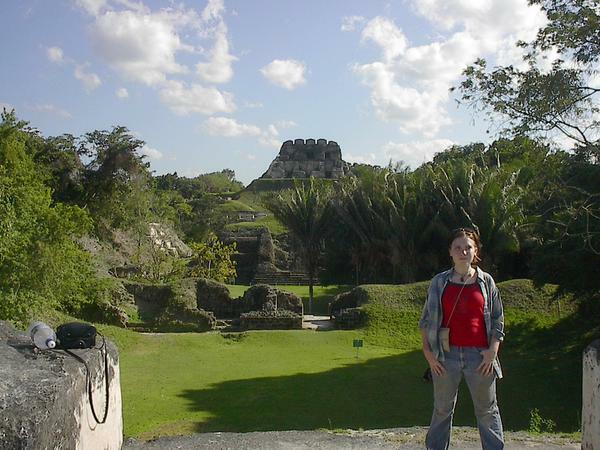 So I set out to visit Xunantunich, the 5th time I have visited that site. The cab driver tried to charge me way too much, halved it when I reacted badly and I decided just to pay even though it was still over priced. Too much hassle not to. The ferry across the river was new but the ferry driver was the same. Mike. He claimed to remember me. He has run the ferry since the 80s. He said there were archaeologists afoot which surprised me…and there were a lot of them. I stayed away though, for the most part. I was shy. Too shy. I sent an email later. So there it was. 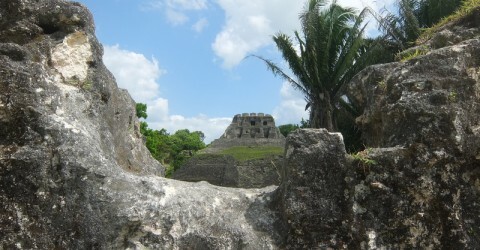 My first Maya site in over 11 years. A place of memory. Manicured memory. I can’t even fully remember being the person who was there before. What was going on in my head. I should try to revisit my livejournal entries on this topic. On all of Belize. In a way it is good that I don’t have access to them right now or else the would cloud the right now…but they do cloud the right now. I put myself in the same position that I was in 11 years ago: a matching photo. I suppose I should come back in a decade and do it again. On the way back I took a collectivo taxi for a far more fair fare. The driver only spoke Spanish but, yet again, I felt, well, pride and delight that I could communicate in that way. I think the difference is that with Spanish here it doesn’t have to be even close to perfect, everyone expects a muddle. Okay enough Spanish. Okay enough English. Maybe even okay enough Kriol. There isn’t a lot of pressure. There is a lot of meeting halfway. Language in Belize, it seems, is like race in Belize: whatever.